Have you ever gone into a supermarket or megastore with the intention of buying a few things and walked out with much more than you intended to buy? Did you then get home just to realize that you forgot to buy some of the things that actually made you go shopping in the first place? You are not alone. 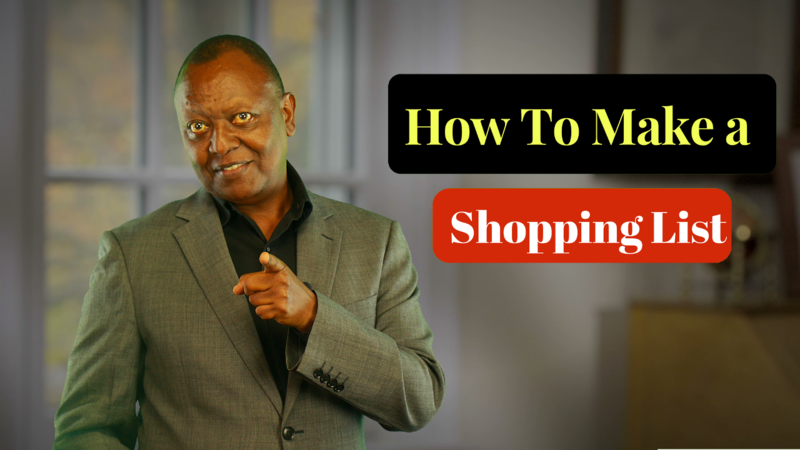 Today, we look at how to manage our spending while shopping by making a shopping list. Please CLICK HERE to watch on You Tube. Most professionals with a good income are in a position to comfortably pay for the necessities of life. Bills like rent and electricity as well as food and clothing expenses, while not cheap, are at least affordable for most people who are in employment. What causes most people the financial hardships that they experience is the discretionary expenditures that they make. This is the money spend on things that they do not really need, and sometimes do not even want, but are enticed into buying while shopping. There is a field of learning that retailers spend millions of shillings on every year that studies what is most likely to make people spend money in stores. Therefore, everything about a modern store, from the lighting, the music, the layout, the colours, everything, is carefully calculated to give you a sense well-being. This well-being will then make you far more likely to spend money on items that you had no intention of buying when you entered the store. It may be surprising, but for many people who overspend, the problem is not that they want to many things, but that they succumb too easily to the devices in stores that are designed to persuade you to make a purchase. Therefore, the most important thing to help you reduce spending on unnecessary items is to discipline yourself when you are shopping and not be tempted into making the purchases. Please CLICK HERE to watch on You Tube. One of the best ways to avoid succumbing to unnecessary purchases is preparation. What this comes down to in practice is making a shopping list. Then when you are in the store, stick to the list. Even before going into town or doing your Christmas shopping, or shopping for clothes, make a list of what it is you want to buy, how much you are expecting to pay and then stick to the list. Obviously you will not be able to know exactly how much everything will cost but at the very least you can limit yourself to only buying the items on your list. Please CLICK HERE to watch on You Tube. Another thing you can do is set a maximum amount to spend. You can set the limit at an amount you know you can afford and are comfortable with beforehand and then you can keep yourself within this limit. You can even consider taking out the cash you are prepared to spend beforehand and then leaving your credit at home. Whatever your limit, keeping to it, and deciding in advance what you want to buy and what you want to spend is the secret to keeping your spending under control. Remember, without control over your spending, you will never have any money to invest. Without investing, you will never become financially independent. So do it for your financial independence!